Tiny lets her back feet be her pillow on a rainy, rainy day. Thousands of pets were left behind in the wake of Hurricane Katrina: trapped in empty houses, stranded on rooftops above the flood waters, wandering alone through deserted streets. The U.S. Senate is considering the Pets Evacuation and Transportation Standards (PETS) Act, which would require that pets and service animals are included in disaster evacuation plans.Please help us get this law passed today. Send one of our moving eCards to your friends and family and urge them to take action. 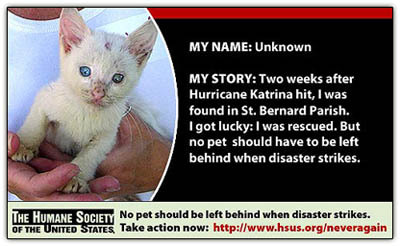 Each card tells the touching story of a pet rescued by The Humane Society of the United States after Hurricane Katrina. Here's the eCard we'll be sending to family and friends, urging them to contact their Senators. Once your friends receive an eCard from you, they can fill out a form that will be forwarded to their senators and then email cards to their own friends to spread the word. 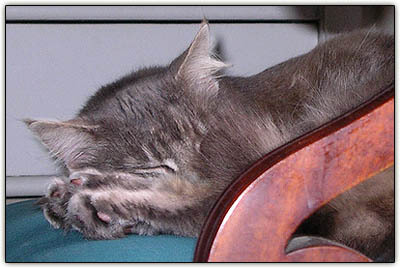 Back-feet pillow unavailable? Babe settles nicely for a fluffy tail. It's easy, and we want you to know that Hurricane bloggers Tiny and Baby are counting on you. Update: Lots more animals aboard Modulator's 91st Friday Ark. They [the Bush administration] do believe that people should rely on state and local response and private charities . . .
Well, you know, that's what they always do. We've been living with that kind of rhetoric for the last 4 1/2 years . . . Every time anyone raises any kind of legitimate criticism and asks questions, they're attacked. She and her husband consider the performance of FEMA under James Lee Witt, its former director and a fellow Arkansan, to be one of the true success stories of the Clinton administration. The Clintons believe [It depends upon what your definition of "believe" is] the agency has been degraded under Bush. Privately, Clinton has been incredulous [shocked, shocked?] over what he regards as the administration's failure to grasp quickly the perilous situation materializing in New Orleans, particularly for poor African Americans [begin violins and "Ron Brown's Body" fake but accurate tears]. Hillary Clinton says FEMA was more effective when her husband was president. The victims of Hurricane Floyd might venture a different opinion, and it wasn't FEMA [but the Louisiana state government, as reported by FOX News' Major Garrett] that kept supplies from the Superdome. 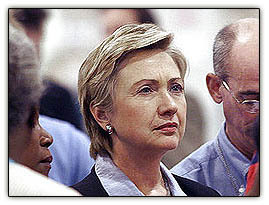 During a post-Katrina conference call with reporters, Sen. Clinton said, "Helping localities do what they needed to do to mitigate damage -- that philosophy governed FEMA during the Clinton administration. It obviously was rejected by this administration." Keep on dreamin', Hillary, and hope the great unwashed you're counting on for enough votes in 2008 doesn't find out that FEMA's performance during those halcyon days of yore, rather than "one of the true success stories of the Clinton administration" was just business as usual on the part of a bloated federal bureaucracy. 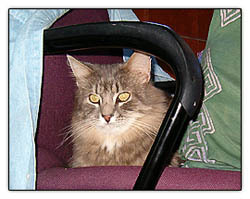 Again standing in for animals displaced by Katrina -- until we get some images from the folks at Animal Rescue League of Boston, now on the scene in Lafayette, Louisiana -- Baby assumes a waiting-to-be-rescued stance as he applies the think system to dislodge our sister (right) from his favorite chair at Goomp's during Labor Day festivities over the weekend. In addition to an increase in the amount of rescue efforts we are starting to hear more success stories of animals being reunited with their owners. We can’t stress enough the importance of calling the hot-lines to provide descriptions of lost pets and, if owners looking for lost pets are still in the area, stopping by the shelter to look for their pet. The best way to assist in the disaster relief efforts is to make a donation to the organizations involved so that they can purchase much needed supplies and equipment for the rescue and relief efforts and provide assistance to animal welfare groups impacted by Hurricane Katrina. We second that thought. Speaking of donations, the "Blog for Relief Weekend" wrapped up at midnight last night, raising over $1.2 million in five days for bloggers' chosen charities. Thanks again to our wonderful and generous readers and fellow bloggers for helping push this blog's final total to $760 for the Animal Rescue League of Boston's efforts in collaboration with the American Humane Association. According to an AHA field report, the ARL of Boston folks are focusing on sheltering and water rescue efforts from their base in Lafayette, Lousiana. This just in. 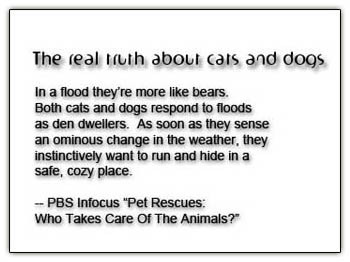 The real thing (You can take the rest of the evening off, Baby Cakes) on CNN's "360 with Anderson Cooper," a traumatized pussycat rescued from the flood by the good folks of Noah's Wish. Have you noticed the comments on some blogs scoffing at helping displaced animals when so many humans are still stranded and suffering? In our view, there are two things wrong with that kind of thinking. First, we have a social contract with the animals we take into our homes. We give them food and shelter and affection in return for -- as our friend Carol's mother used to say -- "having something live in the house" (and perhaps a little mousing on the side). We are honor bound not to abandon these earnest, amusing, sentient beings midstream, so to speak. Secondly -- related, but with the emphasis on our own mental-health needs -- there is the Thoreau factor, the renewing and civilizing powers of nature evoked in our fellow New Englander's famous line, "The most alive is the wildest. Not yet subdued to man, its presence refreshes him." We may like to think of our "house pets" as domesticated, but underneath -- especially with cats -- they are far more in touch with their feral selves than most of us are. Our friend Carol, the one whose mother spoke of "something live in the house," herself used to say -- in an attention-grabbing reversal of the old saw -- "Children are animal substitutes." For a lot of people, there's more than a grain of truth in that. You've probably heard reports of some folks Down Yonder refusing to be rescued because they cannot bear to leave their animals. As flood victims begin to experience the symptoms of post-traumatic stress disorder, what better therapy than being reunited with one's loved ones, whether human or animal? 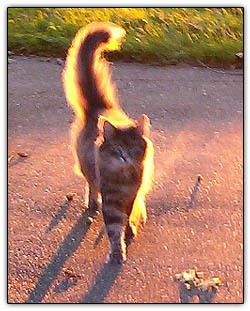 Backlit by the setting sun, Baby trots towards us in anticipation of post-cookout treats late afternoon down Goomp's. 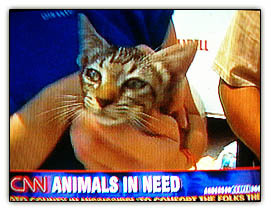 $771.300 in contributions so far for "Blog for Relief Weekend," and this blog has raised $760 from 14 contributors for the Animal Rescue League of Boston's efforts on behalf of animals displaced by Hurricane Katrina. Anyone out there want to help? There's still time. Click here to make your contribution, and then click here to log in your donation to the TTLB database so your contribution will be counted in the final tally. 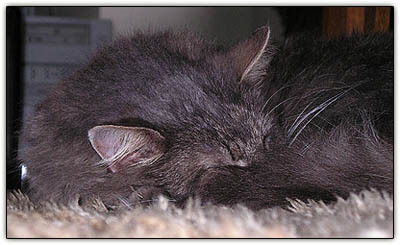 Update: Conservative Cat hosts this week's Carnival of the Cats, "a non-political respite from the vehement echo chamber that the blogosphere spins intself into during the week." This cat may be on to something. You've heard of hurricane babies? Well, Matt Drachenberg's cat just had hurricane kittens! But back to the cats. Tiny is raising money for hurricane relief. 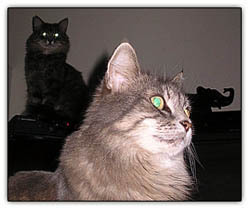 The Oubliette's cats weathered the storm, and were oh, so concerned about it. Lastly and importantly, here are some tips on cat evacuations, to keep in mind for future storms. There's much more at Friday Ark. Speaking of Arks, let's help Tiny keep her fellow Animal Americans afloat by supporting this blog's charity of choice, Animal Rescue League of Boston. As of 8:45 EDT this morning, "Blog for Relief Weekend" has raised $574,630, and this blog has raised $610 from 11 contributors for the Animal Rescue League of Boston. If you haven't contributed yet, please consider adding your support to help the animals displaced by Hurricane Katrina, and don't forget to log your contribution at TTLB to make sure it gets included in the totals. 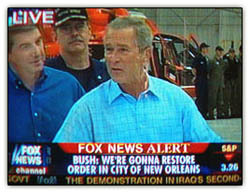 "Let's focus on what actually happened"
GW arrives in Mobile midday to board a helicopter that will fly him over the devastated remains of the Crescent City. Even as the President pledges to restore order, chaos of Third-World proportions reigns. FOXNews reporter Steve Harrigan: "I feel like I'm in an abandoned city where two sides are fighting it out. It's not very reassuring." Meanwhile, throughout the morning and early afternoon, waves of convoys -- National Guard troops, military personnel, firefighters and others -- stream into the city Cavalry style. I have my issues with the way this was handled, but for now I’m keeping it to my self. None of this half assed Monday-morning quarterbacking is going to do a damn thing to get those people out of there, but the corrosive effect it will have on our government serves no one. Stop looking for someone to blame, and start looking for a way to help. This is the greatest city! Our hotel room is on the 40th floor, right on Bourbon Street, and I can look down over the whole French Quarter and see what’s going on without even going down there. We have in-room VR, so this morning I put on the helmet and there I was, back in old New Orleans the way it was before this flood or something that they had about twenty years ago. It was okay, but it was small and dirty and nothing much interesting was happening, just a lot of people eating seafood and getting drunk and watching other people take off their clothes. We think Richard's definitely onto something. They've already got stuff like that at the Grand Canyon, where most tourists just say no to the real-life adventure and relative discomfort of a muleride to the bottom, opting instead for the wide-screen video version in air-conditioned, couch-potato comfort at the top. Update: In a brilliant understatement, The Commissar of The Politburo Diktat lets leading bloggers of the left and right speak for themselves. 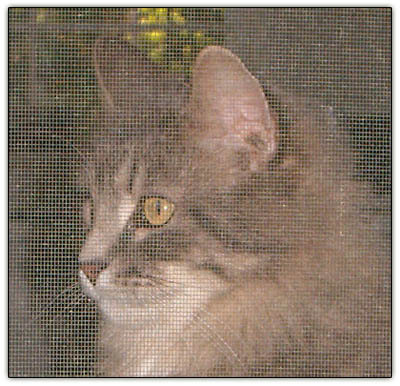 Baby behind a kitchen-window screen, staring at his sister outside on the terrace, could almost pass for one of those abandoned kitties left behind by a flood-fleeing family, waiting to be rescued, except that we cannot imagine leaving our animals behind were we forced to flee our home for whatever reason. Abandoned doggy awaiting rescue (details unknown) from American Humane Association website. In a way, I worry more for the dogs, than the cats. Did you see the face on that poor doggy? Contrast that to the face of the totally fed-up pood in one of your previous posts. It's true. The dog is distraught, the cat, disgusted. Both can use a helping hand, though, and that's where organizations like our flood-relief charity of choice, the Animal Rescue League of Boston, come in. There's still plenty of time to make a donation and then register your participation in the blogosphere's "Blog for Relief Day" data base by logging in here. So far -- as of about 8:10 p.m. EDT -- the effort has raised $106,572 in contributions for a variety of favorite-son charities. We're proud to have done our part by raising a respectable $275 from 5 sources, not all of them relatives. Could anything be more American -- not to mention blogorific in the "Invisible Hand" sense -- than for an aggregate of individual acts by a widely disparate group of people in friendly competition with each other, each vying for pride of place by attracting the most support to help the larger community, creating a whole that is greater than the sum of its parts? It is truly a good thing. Flood relief? What's that? Tiny doesn't watch TV and doesn't read blogs, but she didn't seem to mind standing in for all those flood-plagued furry friends being looked after by the fine folk of Animal Rescue League of Boston in the wake of Hurricane Katrina. We'll post some pictures from the front -- Jackson, Mississippi is where they're at -- as soon as they come in. The Animal Rescue League sent its lead manager, Nicholas Gilman, to Jackson ahead of the rescue team. His initial experience there was a long line waiting for gasoline, reminiscent of the gas shortages back in the early 1970s. Gilman related that ARL would serve two immediate and important roles in Jackson. The League will help run a temporary animal shelter established at the Jackson Fair Grounds -- the shelter is already caring for some 70 dogs and cats -- and serve on an assessment team to review conditions in Hattiesburg and Biloxi. Teresa of Technicalities -- who's got a few suggestions of her own re charities worthy of support at her own blog -- "The kitties and puppies will be getting something from me in a little bit. I just have to go find the credit card." Janette of Common Sense Runs Wild -- one of three webmistresses of The Cotillion, which is supporting American Red Cross flood-relief efforts-- "If [Sissy's] impressed with [Animal Rescue League of Boston], then so am I." 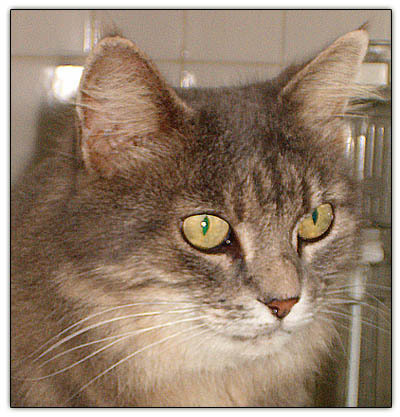 Jennie Taliaffero of The Greatest Jeneration, who already gave to the PetCo Katrina fund, sponsor of ARL of Boston's collaborator, the American Humane Association: "I may give some more to your Boston charity, too. Our 4-legged companions must be saved along with the people!" We couldn't agree more. Thank you, ladies, for your humor and for thinking kind thoughts about a pussycat and various other deserving members of the Animal American community. If you do contribute, be sure to log in your contribution (figures only, no dollar sign) at TTLB's "Add Your Contribution" page so it can be entered in to the Ecosystem database and credited to this blog's fundraising acumen. Katrina Flood Aid: "It's what we do"
"Hurricane Katrina has forced millions of people to evacuate -- many without their pets," says Marie Belew Wheatley, president and CEO of the American Humane Association. "And our Animal Emergency Services is on the ground, ready to help reunite families, one pet at a time." Animal Emergency Services is working closely with other groups, including our own charity of choice -- the Animal Rescue League of Boston and the Veterinary Medical Assistance Team (VMAT), to coordinate the most effective response and ensure the safety of the largest number of animals possible. Check out American Humane Association release for details. 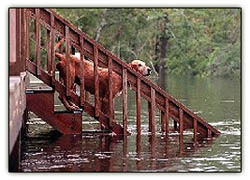 More news on Hurricane Katrina animal rescue efforts. When other nations are hit with calamity, whether it be terrorism or a natural disaster, it is the United States that comes to the rescue. The United States gave more than all other nations combined to the Tsunami relief efforts in Southeast Asia last December. After the September 11 attacks, the Red Cross alone received over one billion dollars worth of contributions. The vast majority of funds came from individual Americans committed to helping our own. Alexis de Tocqueville wrote that "America is great because America is good." This generosity is a reflection of that goodness. And yes, I am trying to encourage some friendly competition here. Tomorrow [Thursday] morning I will be publishing "leader boards" which show which charities are receiving the most donations, and which bloggers have been most successful in encouraging their readers to donate. So get your readership fired up! Reporting for duty, sir. Once you make a donation to the charity of your choice, you can log in your contribution at TTLB's "Add Your Contribution" page so it can be entered in to the Ecosystem database. As our regular readers know, we are recommending Animal Rescue League of Boston. See who is supporting this charity. Besides ourselves, we note early this morning already two bloggers new on our cyberhorizon are promoting this blog's chosen charity, Animal Rescue League of Boston, blogged here Tuesday. JT of Old Controller, who describes himself as a "retired AF officer, wannabe writer. We have five dogs and two cats, and feed every squirrel and bird within ten miles." Mark of South Puget Sound Libertarian, among other things a vet of the Army Medical Corps during the Vietnam war, who writes "Having been frightened and depressed by the seemingly irresistible march of big government, I first decided simply to avoid it all. But now I have re-engaged and started this web log. I'm having fun . . . so far. Thank you, gentlemen, and thanks again to blogpal Teresa of Technicalities for her boundless moral support to all creatures great and small, including angels. Soldiers' Angels, that is, whose Operation Katrina Soldiers Relief Fund is another most worthy project. We'll be posting more names of ARL Boston supporters here as they come in, as well as pictures and reports from the front from the ARL Boston team as they become available. Update: Thanks to Kitty of Kitty Litter for linking our original ARL Boston post: "I can't even think of what would happen to our beloved pets in a flood of this magnitude." Check out what happened to a herd of Suidae in this photo flashback from Hurricane Floyd flooding in 1999, linked by Kitty at Byrd Droppings. 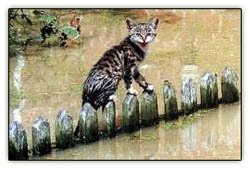 "Stranded cat on top of a fence awaits rescue" from What About Cats. The team is equipped to handle large and small animal rescue, floodwater and swiftwater rescue and to assist in transportation of large animals. "You realize you've just gone to a new level," notes Tuck. What do you mean? "You're doing telephone research for your blog." Whatever it takes. Hugh Hewitt, Glenn Reynolds and the immediate blogosphere will be blog begging en masse this Thursday. Be sure to check out their blogs for other causes worthy of our support. A day of blogging focused on raising awareness of and funds for relief efforts to aid those affected by Hurricane Katrina. See here for more information, and here for the TTLB Katrina topic page. Participating blogs are invited to enter your blog and your recommended charity into the TTLB database.